Hi there and welcome! So glad you dropped by today. In my quest to use all the products I order (so I can truthfully tell my hubby that I don't order anything unnecessarily), I got out a photopolymer set that I have not yet inked up, Balloon Bash! 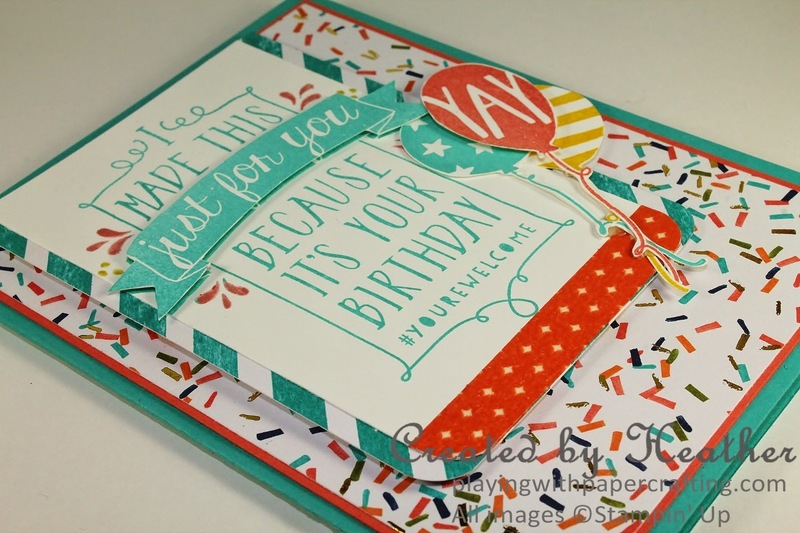 And because I hadn't used the coordinating Designer Series Paper, Birthday Bash, very much, I was able to kill two birds with one stone, so to speak. I used the sketch from Mojo Monday Challenge #387 because this set looked made for the challenge. Thanks, Julee Tilman for your amazing creativity! I used the shield stamp from the Balloon Bash set for the circle in the Mojo sketch. I admit, I was a little taken aback when I got the stamp out of the box, because the picture on the package insert is quite a bit smaller than the actual stamp and would have been more to the scale of the circle in the sketch. But my whole design had been worked out using this stamp so I proceeded as planned. Just be aware that with some of the new big stamps, the image is shown at 70% on the insert so all of the images will fit on it. I inked up the image in Bermuda Bay ink and then used a Qtip to remove the ink on the little "splashes" around the banner and reinked them in Calypso Coral and Crushed Curry instead. I then stamped the image on Whisper White cardstock and trimmed it and rounded the corners with the Project Life Corner Rounder Punch after adding the Retro Fresh Washi tape at the bottom. I stamped the image again in Bermuda Bay and just trimmed out the little banner. I mounted it with Stampin' Dimensionals, matching it to the banner in the original image for some vertical dimension. This technique is called Paper Piecing. I stamped the three balloon images and snipped them out as well and added them as an embellishment to the side. 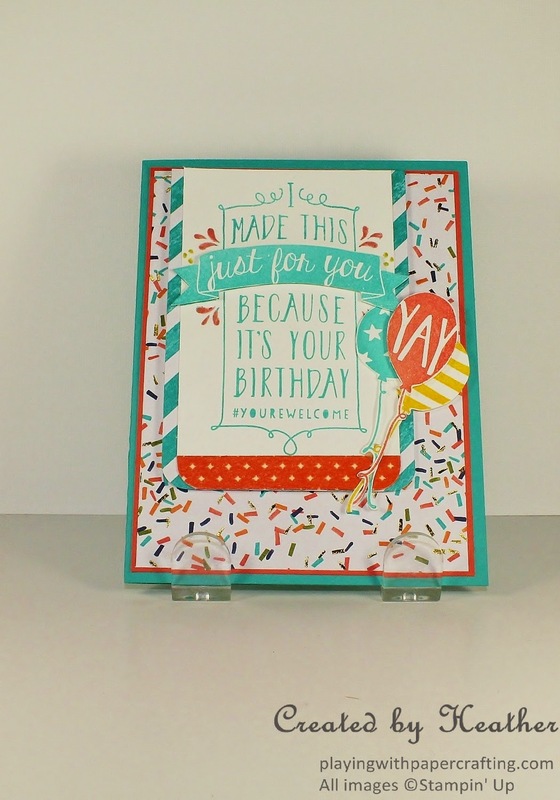 All the Designer Series Paper you see here is from the Birthday Bash Specialty Designer Series Paper and the background design is one of the specialty ones with gold foil bits among the confetti. This would be a great generation spanning birthday card, perfect for kids or adults! Why not give it a try! 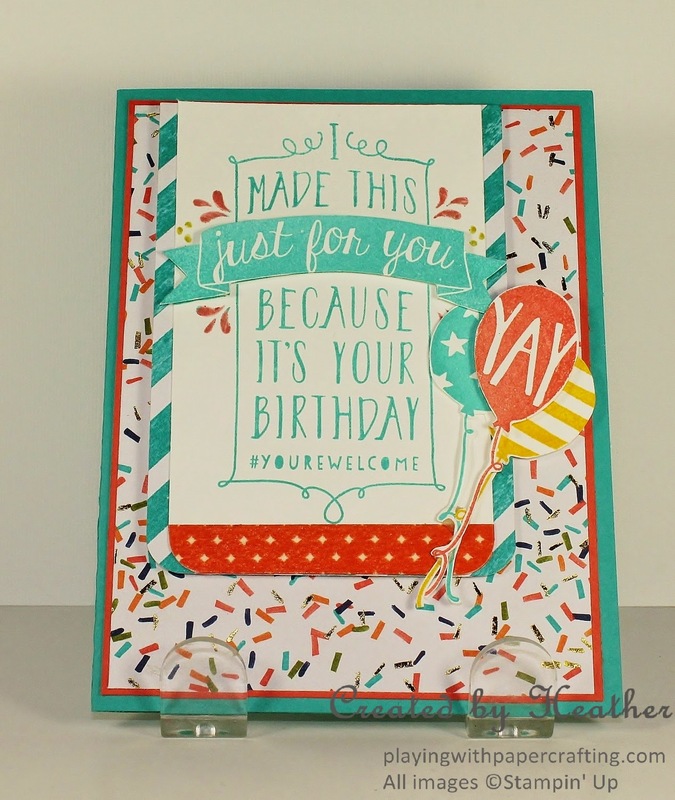 This card just screams 'Birthday Celebration'! I love it. Thanks, Deb! I popped over to your blog and your peacock card is just amazing!